How do we question the global and the local in urban space? Which kind of history appears to us? Which kinds of stories and myths? wandsbektransformance explores the presence of the colonial in northeast Hamburg. It is a research-art project pursuing material and mental traces. How do we approach the colonial traditions in Wandsbek? How do we confront colonial monuments, symbols and tributes to Hermann von Wissmann, Lothar von Trotha and Heinrich Carl Schimmelmann who have won honour and economic power through colonial plundering and slave- and forced-labour? Which kind of culture of remembrance do we find today? wandsbektransformance investigates through art, guided walks and dialogs, interventions and installations the significance of a supposedly limited urban space in global networks and our relationship to these venues. In their 'world tour' through Hamburg-Wandsbek artists and residents, school classes and historians, immigrants and community activists map out their own coordinates. Here the street becomes a canvas of remembrance with pictorial and textual inscriptions, and living bodies create new monuments opposing imperial icons. And everybody interested was invited to participate in this art of exploration and transformation. died already during the transatlantic transportation. Hamburg's colonial history is currently being discussed. Public interest for this theme has grown markedly, not least as a result of the multifaceted cultural events in 2004/2005, including among others hamburg-postkolonial (in German) und afrika-hamburg.de (with English summary). In the tailwind of globalization the colonial history and the neo-colonial present is also being debated increasingly in the former colonies and in European metropoles and ports. The bust honouring the leading slave trader of the 18th century, Heinrich Carl Schimmelmann, was sculptured 2006 and erected by the community administration in Wandsbek. The 'Askari Reliefs' in the so-called 'Tansania-Park' symbolise the colonial greed of the German nazi regime. The monument was restored and re-erected 2003. Several protests have been addressed against it and the Schimmelmann bust. Wandsbek was one of the centres of colonial trade in the Hamburg area - as evidenced in various monuments, street names and factories. Today citizens who have come from Africa live and work here. The so-called 'Tansania Park' in Wandsbek-Jenfeld with its martial colonial monuments of the Nazi era has been controversially discussed. The protests against the in 2006 newly erected bust of the slave trader Heinrich Carl Schimmelmann in Wandsbek has been reported on extensively in the press. The participative wandsbektransformance project aims to pursue traces of the past and present-day processes and cultures of remembrance. Street names in Wandsbek honour colonial traders and remember of colonial goods. 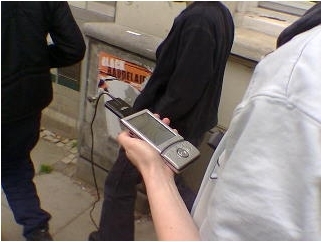 In September 2007 artists from Africa and Hamburg, historians, school classes and local residents intervened in public space. All citizens were invited to participate in the various projects: a street in-scription; a mapping tour using GPS devices; a 'Wissmann hatch' interactive sculpture collecting pictures, thoughts, texts and dreams; 'Wandsbek World White' - an associative town walk and much more. In March|April 2008 an exhibition in the Kunsthaus Hamburg provided insights into this transformative process. Traces of the researches and reactions, mappings and interventions in the form of images, documentations, objects and installations were presented. An extensive program of films, readings, lectures and discussions with artists and historians accompanied the exhibition.